The Yamaha L Series LL16 Dreadnought Acoustic guitar is one of those guitars that make you feel better about the world in general. After all, if you can buy a guitar that not only has a solid Englemann spruce top but solid rosewood back and sides as well, the world can’t be all bad! Made in China and built on the ever-popular dreadnought body, the Yamaha LL16 is broad and deep and is built to hold and project volume like nobody’s business. Even ‘quiet’ playing on this model will project surprisingly well, making this a great choice for a performance guitar. And at just ~$749 (including a case), the LL16 makes the Martin MMV Solid Top Dreadnought Rosewood/Sitka Acoustic Guitar look rather overpriced at ~$1,399, though the Martin does have a better bass tone than the LL16 and an overall richness that the Yamaha just can’t match. The tone of the LL16 is very clear, almost bell like, and has the volume that has made the dreadnought such a popular choice of guitar bodies. The size of this instrument, however, can be a bit overwhelming for smaller players. But if you can handle the reach, it will make an awesome choice for the guitarist who needs a real workhorse that can handle all kinds of playing styles but which can also be heard over the crowd in most any situation. A word of advice to those that purchase this guitar; replace the plastic bridge pins with something more substantial (such as bone); it will bring out the true depth of the LL16’s voice and can make a significant impact on its tone quality. While there are certainly more expensive and fancier dreadnoughts than the Yamaha L Series LL16, for its price range, you will be hard pressed to find a better sounding instrument for the money. 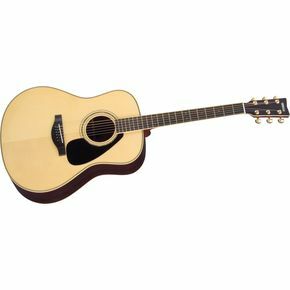 See more great guitar reviews at Yamaha Acoustic Guitars. Hand made by quality craftsmen, using fine resonating woods. Solid rosewood back and sides, solid engelmann spruce top, and a 3-ply mahogany, rosewood neck. Looks great, sounds even better. Sure wish the LL-16 was made in a normal dreadnought guitar size. Now it is just to big. A week ago i tried out this guitar and a few other Yamaha's - just for fun. Plugged or unplugged this one turned out to be a disappointment! I do not think that this guitar is a joy to play (the neck is stiff with a wrong wrist angle) and the sound univiting. The timbre is thin and only by adding quite some bass and mid into the range makes it sound exceptable. I tried them out on my own acoustic amplifier (Jam SR150). If and when you really want a Yamaha guitar, well then at least spend your money on one with QUALITY! Otherwise I would suggest a Takamine or Taylor guitar. Great choice for those who prefer a dread to a jumbo. Few makers can compete with Yamaha at this price-point. One of the few is the Godin group....the Seagull people.